Now that Donald Trump has brought himself a temporary reprieve by having his handpicked ally William Barr suppress and mischaracterize the Robert Mueller report, you’d think he might use his window of opportunity to advance a message, or show some leadership, or try to convince America to forget about his Russia scandal. Instead, Donald Trump and his team seem more focused on vengeance. This isn’t necessarily shocking, as the ever narcissistic Trump – who has repeatedly committed obstruction of justice with his tweets, and who famously tried to collude with Russia while answering a question during a presidential debate – has surely convinced himself that he is in fact somehow innocent of all this. That means he wants revenge on those who exposed his Russia scandal to begin with, and he’s dispatched his team members accordingly. It’s already not going well for them. Donald Trump’s criminal defense attorney Rudy Giuliani appeared on Fox & Friends on Monday morning and claimed that someone tricked the FBI into launching the Trump-Russia investigation. This is a surreal accusation, considering that the investigation – which was later taken over by Robert Mueller – resulted in criminal indictments against more than three dozen people, including a number of people in Trump’s inner political circle. Nonetheless, Rudy said on-air this morning that the person responsible for initiating the Trump-Russia investigation will be held “accountable” according to the Fox News website, while refusing to provide any clues to who this person might be, or what walk of life they might be from. 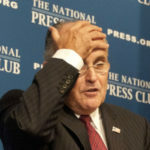 Even as Giuliani made this apparent threat to abuse the power of the presidency to take out revenge on this person, while offering no evidence to back up any of his ramblings, Rudy simply said that we should all “just pay attention” to whatever happens next. It’s not clear if Donald Trump and his team will actually attempt to illegally use the presidency to carry out personal revenge against those who have helped expose his scandals, or if this is mere public chest-beating from Rudy Giuliani. But even if it is just talk, this is a really bad idea. This will keep the public focus on his Russia scandal. And when the Mueller report inevitably surfaces with all its ugly details, it’ll make Trump look even worse for having tried to harm those who worked to unearth those details.